For those of you keeping score, you can add one more to the list of things I said I'd never do as a mother. Call me desperate, but I have let my child cry in his crib the past few days according to the ever-so-structured plan of Dr. Weissbluth. I cannot begin to describe how hard this is for me. I would rather someone strap me down and poke holes in my abdomen with needles. But the boy has to sleep, and nothing else seems to be working. We tried to "Feberize" him the other night. It was a disaster. Every time we would go in to sooth/pat/talk to him he would scream to the high heavens. He hated it that we came in and left again and kept repeating that pattern. So we ended up just letting him cry on his own. It was awful. He is sleeping better at night though – he had one night where he slept for 7 hours straight. And he's napping better as well which puts him in a happier mood. And then today the ultimate happened. We went to swimming lessons this morning (more on that later) and then lunch with our friend Jeff. (Thanks Jeff for moving our tv for us) We got home and we're both tired, but Jack didn't fall asleep right away and I was too tired to carry him around. So I just set him in his crib while I went around trying to straighten up a little. I can not lie. This sight brought instant tears to my eyes, and not just because he's so darned cute. I never imagined in a million years that Jack would go to sleep on his own, but here it is. Now I know part of it is because he was completely exhausted from swimming. 30 minutes in the pool is a lot for the little guy. I was proud of him though – he didn't cry once. Apparently that's rare because every other Water Baby was screeching up a storm. He wasn't smiling and laughing like normal – I could tell he was a little out of his element to say the least. But he was a good sport even when I dunked him all the way under. The water was a little chilly at first, and I looked over at him at one point and his little chin was quivering. At first I thought he was crying but then I realized his teeth were chattering. But since he has no teeth it didn't make any noise. Poor guy. In all I have to say I am a fan of swimming – a good activity for us and it tires him out. What could be better? If the sleeping thing gets in order now, life will be good. I am glad you got the book. I hope you don't hate me for recommending it. I hope sleeping gets better...hopefully it will be worth the crying soon! HOORAY! Mark this milestone on your calendar. Now let's see what happens tonight. YEAH!! So happy for you...did you immediately take a nap while he was asleep?!? Swimming! It does wear them out! My neice and nephews are loving the pool and when night time comes the crash! Glad Jack fell asleep by himself...I agree with Ruben - the kiddo is adorable! i have no idea what feaberizing is (is it painful? i thought maybe it was like febreeze...). 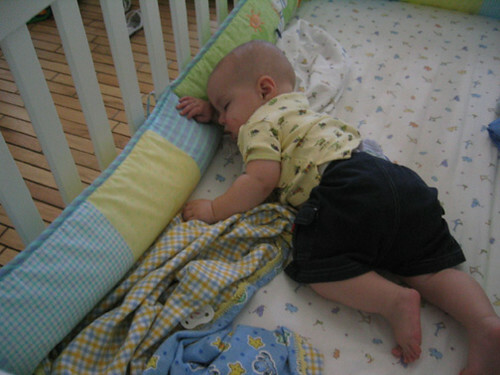 it is so nice to catch up on your blog -- i always wondered about the baby-sleep-crying thing. it is good to read your posts, even though children are FAR off for me. you looked lovely in the pink dress at the baptism too. saw alexia and pat and dulcy this last weekend -- they all say hi! are you still coming to Seattle in august?